The site on Ludgate Hill has been the home of a cathedral to St Paul since the seventh century. The present St Paul's Cathedral was completed in 1708 and was perhaps Sir Christopher Wren's most famous architectural gift to the city of London. 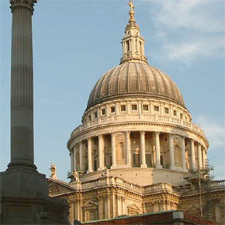 Built after its predecessor was destroyed in the Great Fire of London, Wren's St Paul's was inspired by the Basilica of St Peter in Rome with its trademark dome, which was specially constructed to be 365 feet high, one foot for every day of the year. St Paul's has played host to the funerals of some of Britain's most influential historical figures: Churchill, Nelson and the Duke of Wellington have all been commemorated there. During the Second World War, when much of London had been reduced to rubble, the cathedral remained almost unscathed, a rallying point for Londoners. More recently in October 2011, the Occupy London encampment was established in front of the cathedral.